The difference between neurotics and psychotics is to be understood by deciphering the picture. Neurotics live on the ground like you and me. But, whilst living alongside you, they can also see the castle in the sky. They also see real life, people, their dentist, their doctor, their Instagram feed, the cat and the dog. They can also see a flying castle, but as most of their world is real and normal and demonstrably present they know the castle cannot be real. And so they tend to realise that the problem is with themselves. They can see a castle but know it’s a bit silly. Psychotics live in the castle. Psychosis manifesting as dental disease is very rare. It’s almost mythical, so its medical name is really rather appropriate and almost epithetical: Phantom Bite. We will come back to that shortly, but before we leave that subject I must be clear. Phantom Bite is a disaster, a maelstrom, a crippling headache, an epic complaint, a potential stalker, a black hole for your time and energy…a living nightmare if you meet a patient with it. You have one shot at spotting it, and, for all’s good sake, do NOT try to treat it with dental care. So, now back to neurotics: To a greater or lesser extent we probably all have our particular neuroses, be that dental anxiety/phobia, hypochondria, a moodiness, restlessness, shorter tempers, being worrisome or just having ‘ants in your pants’. 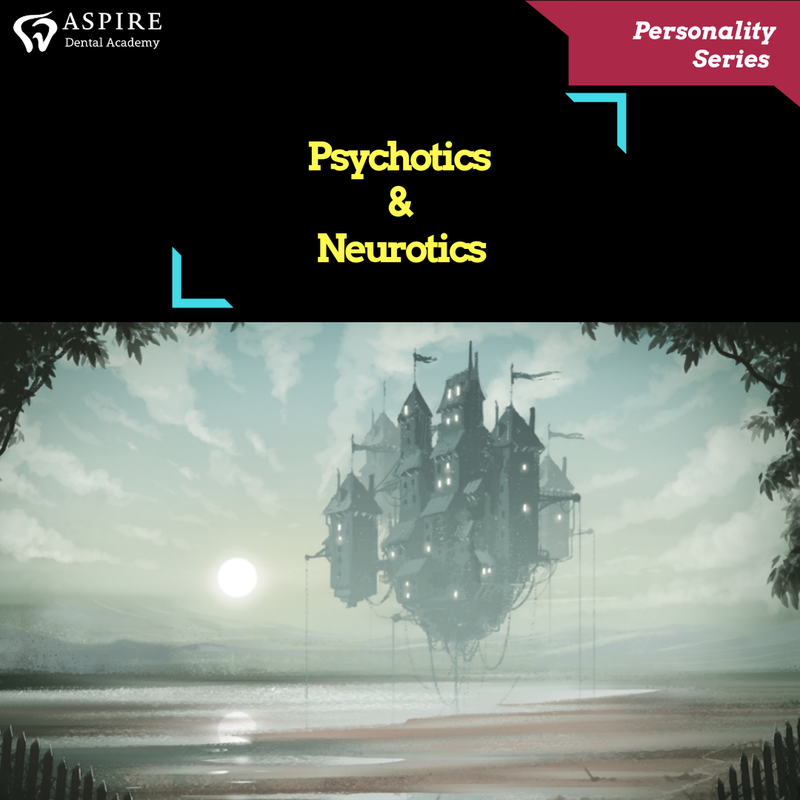 Neurotics are everywhere and will sit on a spectrum of severity. They may be severely neurotic about most things and come across as a highly anxious and difficult individual, perhaps diagnosed with a more general anxiety disorder. More common is a neurotic who is focused on a particular aspect of their life, health, cleanliness or hairstyle, or perhaps on giving what they consider to be a full and complete dental history. This may take twenty minutes!! The point is neuroticism, if it manifests in your dental surgery, will cost you time and energy. To frame that more fairly, all patient care takes time and energy. Neurotics may require more, is all. How much they need and how much you are able/willing to give depends on your individual relationship and emotional energy reserves. I’ll leave that to you. Suffice to say I doubt you want to work a full day treating only highly neurotic people as you will not be as productive and will be mentally exhausted by day’s end. Equally, we get great satisfaction, and rightly so, from helping people, and some dentally-focused neuroses can be managed by you and your soft skills. This presents you an opportunity to recruit a patient for life. A formerly neurotic patient, reassured and effectively treated by you and your kind professional persona, will be loyal to you, will offer word-of-mouth endorsements and gratefully follow you until you retire. Neurotics therefore may be a positive. Phantom Bite is a term used to describe patients who are preoccupied with their supposedly abnormal dental occlusion. Its official title is Occlusal Dysaesthesia. I have come across just four such patients in a career of over 26 years, 12 of which as a specialist and hospital consultant. Each time has been harrowing, upsetting and utterly frustrating. Perhaps the most recent case was the worst, and was oh-so stereotypical. Patient: “Well my shoulders are misaligned and this hurts my neck and has caused spinal kyphosis, which you will know has now been proven to disrupt both liver function and effective digestion. So I’m imbalanced and in pain. It’s been going on for 2 years since the dentist adjusted a tooth; they didn’t mean to get it wrong, but it has thrown everything off alignment and it’s been so awful my family have distanced themselves from me, and my brother—who is a GP—says I’m mentally ill, which is so cruel as I just need a precise adjustment and I know you can do that for me. Will you do it today? I’m desperate. This is a real patient. He was seen by me and then Martin Kelleher at Kings College. Martin is a genius. He is a masterly educator and one of the finest humans I have ever known. He has always focused his efforts on helping patients and helping dentists. He was my lead teacher and biggest influencer on my career to date. This patient stalked him and almost broke into his home. Martin wrote a wonderful article on Phantom Bite in January 2017 and I have borrowed the following from it. Sometimes their problems with ‘their bite’ is not their first complaint and instead they are adamant that their ‘teeth do not look right’ and/or that their bite or ‘dental occlusion is wrong’ and that this is causing them sometimes quite weird problems elsewhere in their body. They undergo extensive tests and dental treatment by multiple dental practitioners who, initially flattered by the patient’s praise for their ‘knowledge of occlusion’ at the beginning of the relationship, are often keen to try to resolve the patient’s reported suffering, which is, allegedly, all due to his/her ‘bite’ or ‘occlusion’. Patients firmly believe that their reported symptoms, which sometimes sound quite strange, particularly when they are to be present in remoter areas of their body, will also be cured just by getting ‘the right bite’ or ‘the bite right’. Sometimes their partners are convinced of this as well. In psychiatric terms, this is known as a ‘folie a deux’ (a delusion shared by two people). Sometimes an inexperienced or naïve, but enthusiastic, ‘occlusion focused’ dentist joins in this folly. These patients often appear to be superficially knowledgeable about how their teeth should ‘bite normally’ but will sometimes also demonstrate how they meet in ‘different excursive movements’. Sometimes, they expound quite elegantly on their views about their bite, cusps, slides or interferences or ‘locking of their occlusion’ and/or offer various ideas on what they need to have done to ‘correct their bite’. If a concerned dental clinician suggests that all the reported problems in remoter parts of the body are not being caused by the bite and gently offers to refer the patient for mental health support then, paradoxically, that caring suggestion can trigger a complaint. To avoid a complaint it can be safer for the dentist, paradoxically, not to suggest such a referral and instead attempt some intervention and thereby get trapped. So, if you suspect Phantom Bite do not attempt to provide dental care to address their problem. Do not let them play to your vanity. Refer them. To a local consultant if you are not able to send them to a psychiatrist directly. Be honest about your suspicions however, and you may actually start them on a road to recovery. To learn more about consulting successfully in these delicate situations which require clarity of thought, tact and a certain amount of emotional resilience, you can click the link to book onto one of our soft skills course intakes. Take care everyone and don’t doubt—what’s written above is real!